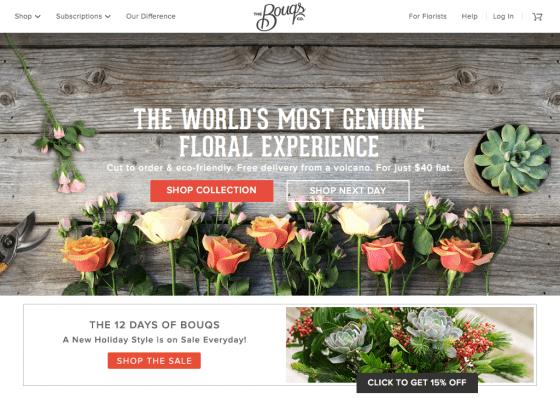 Today’s Killer Startup: The Bouqs Co. The Bouqs Co. delivers beautiful, fresh cut bouquets that come from responsible farms. I love flowers. I mean, I think that a lot of women love flowers because we’re kind of told that they’re this huge symbol of love, but I really love flowers. My grandmother was a dedicated gardener, my mother followed in her footsteps, and if I lived in one place long enough, I’d undoubtedly be one too. Nothing makes me smile quite so quickly as a lovely bloom, especially one that’s unexpected. And oh, how lovely are the blooms at The Bouqs! Just looking at pictures of the bouquets they offer is making me smile – but also making me covet all of them. From the exuberantly random Bohemian bouquet to the more cultured Secret Garden, I want all of them. So here’s what sets The Bouqs apart from other, regular florists. First of all, they guarantee delivery within two to four days of the flowers being cut, as opposed to the 10 to 14 you’ll get from other companies. That means your flowers will last longer, giving you maximum bloom enjoyment time. Also, they charge a flat fee of $40, including shipping, so you don’t have to worry about breaking the bank on a bouquet. They also grow their flowers on responsible (as in environmentally and in how-they-treat-employees) farms on the side of a volcano in Ecuador. They only cut what they sell, which means there’s no waste either! Finally, The Bouqs offers subscription services, including their “Never Forget” option, which you can set up to remind you when an important date is coming; or their “Just Because” option, which will send your love a bouquet on a random day of the week, just because. Finally, they have a “Regular Blooms” option, which lets you sign up for regular fresh flowers. Ugh, I love this so much. I’m gonna go buy my mom a bouquet now. Just because.